I've had a charmed life in music! I first heard the Philadelphia Orchestra as a twelve-year-old and was captivated by its rendition of Brahms' First Symphony, and if I were to play it again I still would be. The thoughtfulness and cultivation of the Orchestra's approach under the right leadership remain unique. Since I am retiring as an opinionated person, the way I've always been, please allow me to express a few thoughts. There is a description, "The Philadelphia Sound," that perhaps was effective in helping our "brand" at one time. But I wish this overused phrase would go away, because it suggests something a bit commercial and cheap .It is inaccurate, because the Philadelphia Sound is actually comprised of many different sounds applied with intelligence and good taste. Yes, Tchaikovsky and Rachmaninoff have their lush moments, and we seldom disappoint! Because they are both great composers, they also have moments of austerity and reserved expression when played well, and we do that too. We are imaginative and flexible and, I hope, will stay that way. We can also play music from all periods with verve, accuracy, and the appropriate sonority and expression. The repertoire of worthwhile classical music is limitless and spans almost four centuries. In Philadelphia, even much of the fairly standard repertoire is unplayed, and some of it is overplayed. I think Orchestras need and welcome some variety. And not all music should be played exactly in the same style, although I often think that the pendulum affecting interpretation has swung a little too far toward the mannered and artificial. I hope that the current craze for great Orchestras to play movie scores tapers off, as I am sure it will. These scores are certainly skillfully written and deserve to be heard occasionally as novelties, but not as fixtures. Serious music lovers should be respected, always. I only played for Leonard Bernstein once in my career. It was at the Mann Music Center in the late 1970's, and he conducted Mahler's 9th Symphony. He made a speech to the Orchestra, talking about the meaning of the piece as he understood it. I remember distinctly that he said, "The enemy of classical music is cynicism". So, beyond sound, we search for -- and often find -- deeper meaning. I've had a great tenure here, and my deepest hope is that our Orchestra and all the music it offers continue to prevail without compromise. I admire all of my colleagues, from our outstanding Principals to all the extraordinarily skillful and inspired section players who contribute so much without receiving individual recognition. We are truly an ensemble because of them! I also should mention our excellent staff, management, and the many passionate and involved Board Members. I thank all of you for the great joy and satisfaction these many years have given me! I intend to continue teaching actively and playing a bit as well, and my wife Kiyoko Takeuti is continuing on in the Orchestra, so I'll be sticking around Philadelphia (with pleasure)! Actually, the "Philadelphia Sound" went out the window when Ormandy was replaced by Muti, a conductor with a completely different ear. His recording of Stravinsky's Rite of Spring and Petruska pulled a sound out of the formerly lush orchestra that was exciting, lean and mean: it's one of Philadelphia's finest recordings, quite neglected nowadays. Stokowski and Ormandy created the "Philadelphia Sound" in order to compensate for the dry acoustic of the Academy of Music, which as we all know, is no longer the orchestra's home. In fact, even Ormandy, a violinist himself, changed the string sound when he recorded XXth Century music to a still massive, but leaner sound, which worked both in the hall and on recordings. 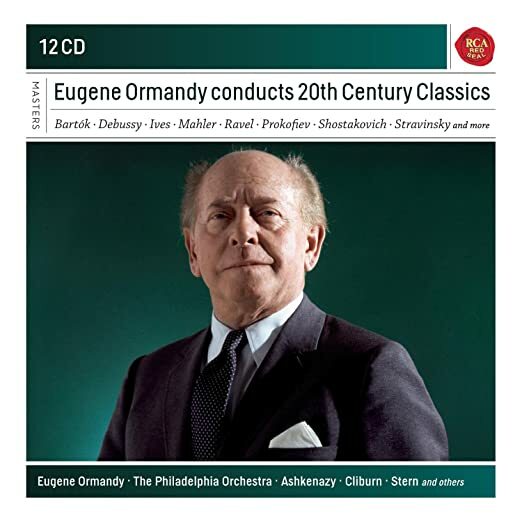 In fact, Ormandy's finest recordings IMHO were made for the Columbia label, and I recommend the set below, along with his Mahler X, Prokofiev & Shostakovich IV & X, available separately. There's been remarkable continuity in the Philadelphia Orchestra's principal oboe chair. Marcel Tabuteau held it from 1915 to 1954. He was succeeded by his pupil John de Lancie, who was succeeded by his pupil Richard Woodhams, whose pupil Peter Smith has been associate principal since 1991. Who would bet that Woodhams's successor won't be in the line of descent from Tabuteau? Thanks for this. Interesting insights about the " sound" and movie scores. A few random thoughts. Most movie scores, I agree. But some exceptions manifest themselves to me, including any films where the music was composed by George Gershwin, Sergei Prokofiev, or Miklos Rozsa. Also, the film Scott of the Antarctic, whose music was composed by Ralph Vaughan Williams, and from which he extracted his Seventh Symphony. A rearbencher in the second violins of the CSO of my acquaintance told me that the film music was better than the symphony. I see that the movie score is at last available on CD. One more thing. One of my favorite performances is Ormandy's recording of the Mozart Bassoon Concerto. This is not repertoire that many associate much with Ormandy, but I think its a wonderful performance and should have greater currency.